Coming up-hugs and questions and explainations. That is so typical of Larry, offering a hug even when he doesn’t trust Eleanor’s motives. Oh and the Robespierre backdrop touches, pure Charlie brilliance. Got to love the little stinker. So, when Stephanie set him in the grass to “do his bidness,” he plucked a flower. Well, this is not at all, what I thought would happen. Good One or as we say EP, you got a Diez. I hope you ain’t seen nothin’ yet! Robespierre is adorable. What a thoughtful little guy. I’ve been dying to know about what’s going on with Elanor forever now! Oh nooooooo what is it? He he hee… I finally get to hold out on the Queen of Cliffhangers herself! Got to hand it to you Charlie, using silhouettes is just pure class. Thanks. I’m unreasonably happy with how they turned out. Sometimes I just go with my gut feeling as to what to draw, and this time it worked. Wow, he actually wants to hug her? Must be serious. As to how she’ll be “cured,” well, see my response to that nerd Hjels. Not to nerd out or anything, but you know… I am a nerd, and my people need to sustain ourselves on the knowledge of continuity of our favorite fictional universes. So, how does your newfound unretirement affect the ending? Is VampireEleanor canon, or…? Even though I am not one of your people, I understand their needs, even though I am not one of them. At all. Whatsoever. So…are you asking me to give away the ending? Okay, this could be the beginning of the Vampire Eleanor saga. Yes it could. And it probably is. I do reserve the right to change my mind, however, even if I’m not a nerd myself. Either way, nerd or not, there are some surprises in store. 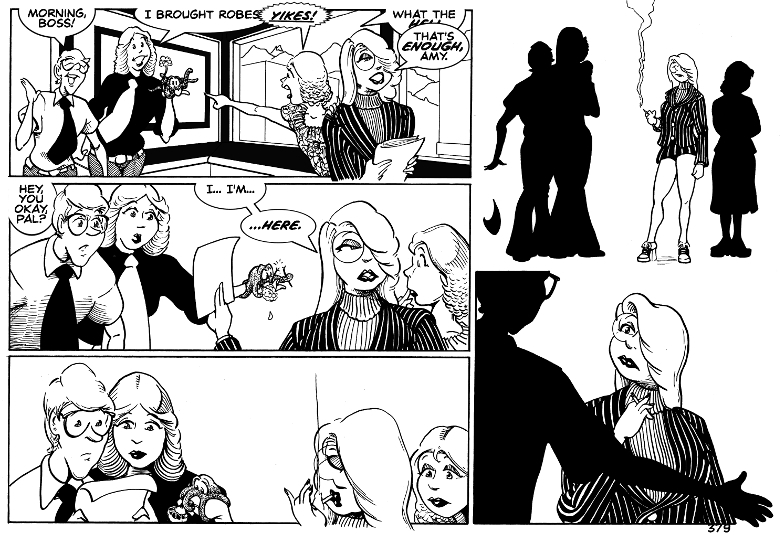 I know this page is serious business, but I can’t help but wonder…what is Robie doing? Did he break the flower in half so he could offer her the stem, or was he trying to intimidate her with his muscle power? Or both? I have no idea, but it’s kind of cute. It’s more the second one. Sort of a “we’re done here” kind of moment. Plus, he’s showing her that it’s not wise to mess with the Robie. here’s a thought, just as Larry gets close Eleanor reaches back and cold clocks him. After which, she says “I do not need a hug, I need the Door!!. I think Larry would get the hint. Now, what Stephanie would do besides smacking Eleanor though the wall, I do not know. Oh, Larry is already thinking about what they’re going to have to do. But right now, comforting Eleanor is more important. Plus, it’s that instinct to hug when presented with bad news. But that’s an interesting thought: what would Stephanie do if Eleanor hit Larry? I think as soon as she heard the “SLAP” she’d be across the room, grabbing Eleanor’s wrist before she finished her swing. Then she’d give her a good talking to. Yeah Kinda think that ‘head to head’ might be Eleanor 0 – Stephanie 1. After all Ms Rossum’s developing some emotional attachments, just look how she reacted to Robespierre and we all know she’s got a liking for Larry. Humanadroid or not she’d still be a force to be reckoned with. But remember, she promised she wouldn’t hurt anyone. Ever again. Still, Stephanie would probably come out on top. Coming back to review after puzzling over your current comic and found that I need to comment on that last scene – but a little differently. It’s been years since I saw it and I may be misremembering it but MAD Magazine did a parody of “The Sound of Music” in one of their issues and I SWEAR Amy’s pose in that last silhouette is a dead ringer for one they had of Julie Andrews…. I think I remembered it mainly because it was a nearly perfect representation of Sister Marie, but HORRIBLY unflattering. You could be right. And you have a good eye, and a good memory.